We're in the midst of an investment app boom. One of the most popular is Moneybox. Here's how it works. Moneybox connects with your bank account and rounds up all your card purchases to the nearest pound. It then invests these “round-ups”. Not only is this a good way to get to grips with investing, it’s also an easy way to save. You don’t have to set money aside each month to top up your investment. Just let Moneybox round up your spare change. This means you can put your “lump sum” savings each month in a risk-free instant access account, ready to be withdrawn if you need some emergency cash. To round up your transactions, Moneybox needs to connect to your current account. It can be integrated with the traditional giants of British banking – the likes of Barclays, Lloyds, RBS and Santander – as well as many of the digital-only challenger banks, like Monzo and Starling. Some banks connect more easily than others. Starling and Monzo connect effortlessly. Moneybox redirects you to your bank’s app, and you just have to confirm that you’re happy with the integration. Barclays, for example, is a little slower. You have to enter your name, sort code, account number, memorable word, and the passcode you use to log in to PinSentry. 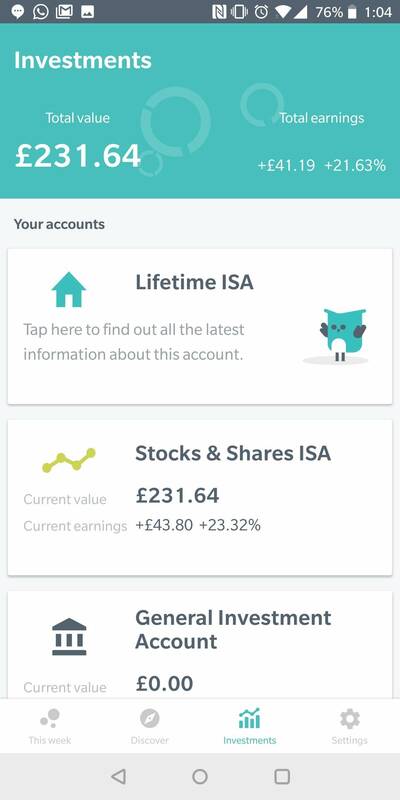 By default, Moneybox puts your money in a Stocks and Shares ISA. But there are alternative options, such as the Lifetime ISA and General Investment Account. 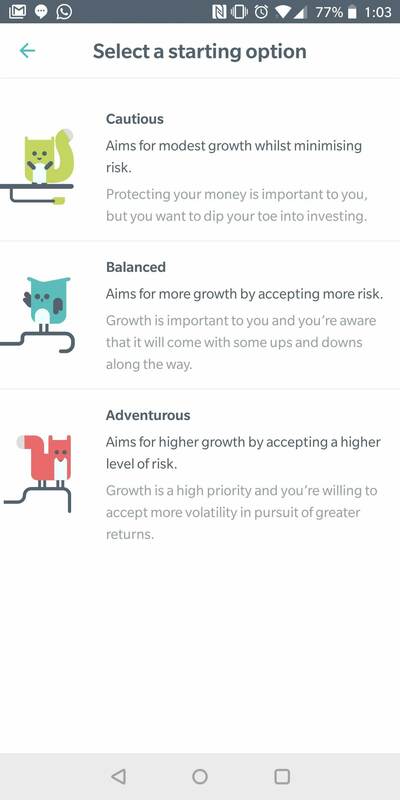 For ease of use, Moneybox presents you with three investment plans: cautious, balanced and adventurous. Whichever plan you choose, your money will be invested in the same types of funds. It’s just the proportion that changes. Cash funds are the lowest risk funds. Global equities are the highest. You can adjust this ratio manually, if you’re feeling confident, but Moneybox recommends sticking with their plans. You can change your plan later if you’re unhappy with its performance. But, as with any investment, your money can go down as well as up. Moneybox can’t guarantee that you’ll get a good return. The Moneybox interface is split into four screens. The first one – called “this week” – shows you which transactions can be rounded up, and how much you’ve already rounded up that week. Transactions can be rounded up (that means added to your weekly total) manually (by swiping down on the list) or automatically. 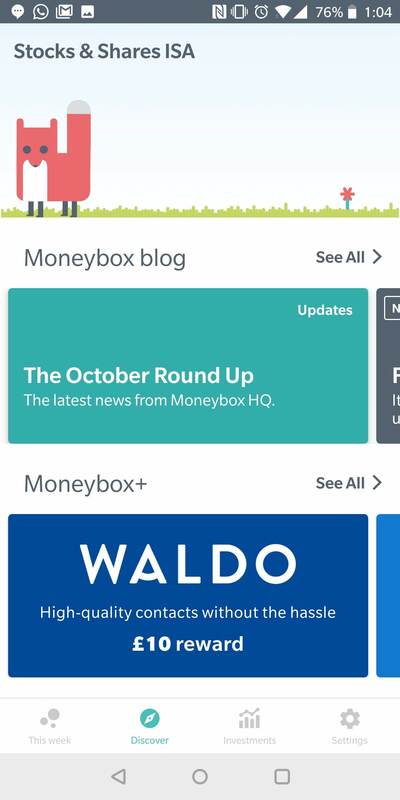 The discover page features the latest from the Moneybox blog, as well as new offers through Moneybox+ (more on that later). Scroll further, and you can see spending insights and the “time machine”, which is a projection of your investment value if you added weekly deposits. 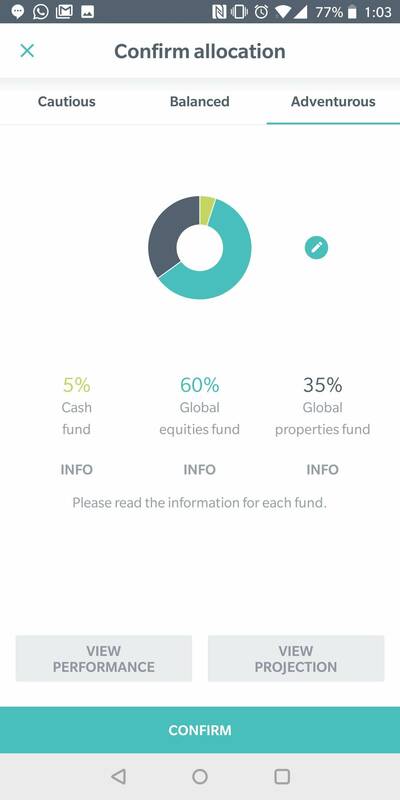 The investments screen gives you more information on your accounts. Tap an account for a detailed summary. 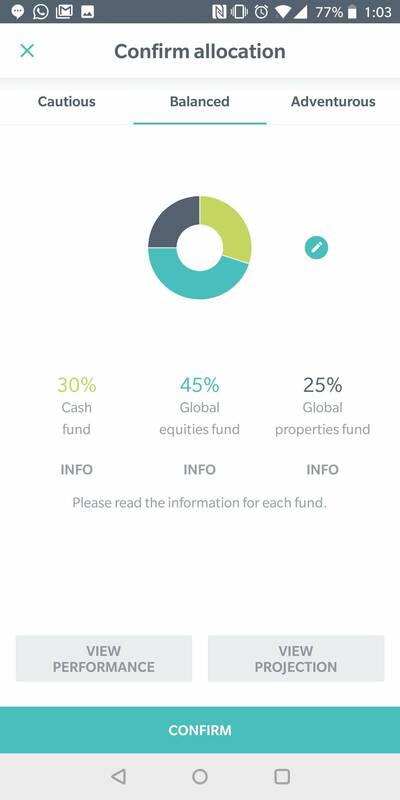 See how much money is in each fund within your plan, and when your next round-up will be invested (it takes a little while to invest each deposit). 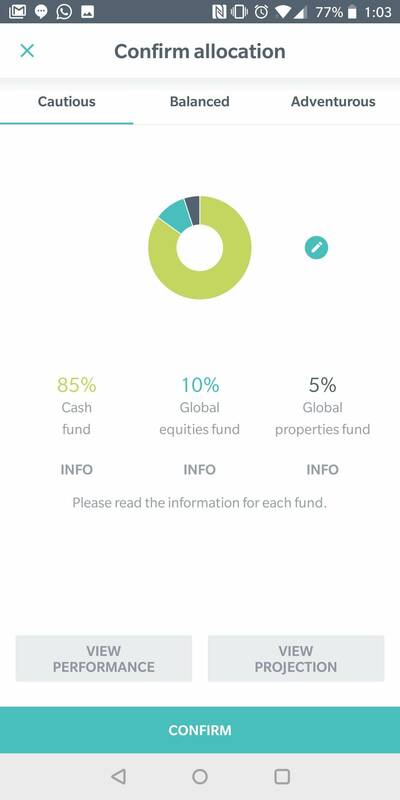 Tap on a fund to see its performance history. You can also use the investments tab to change your investment plan. To do this, tap an account, and then tap the circle in the top-right of the screen. From this screen, you can control your round ups, change your investment plan, transfer money and request a withdrawal. Tap “weekly deposit” or “boosts” to set up additional payments into your Moneybox account, such as a £100 bonus on payday, or a £20 weekly deposit. There’s also a “transfer” button, which lets you move money between your Moneybox accounts, and a “withdraw” button. You can withdraw money from your Moneybox accounts, but it isn’t easy. It takes several weeks to sell off all your investments, which isn’t great if you need to access your savings quickly because of an unexpected expense. This is the same for any Stocks and Shares ISA, and you should bear it in mind before making an investment. Moneybox+ allows you to earn bonuses to your Stocks and Shares ISA by taking out subscriptions and buying products from Moneybox’s partners. You can get started with the “discover” tab on the Moneybox app. 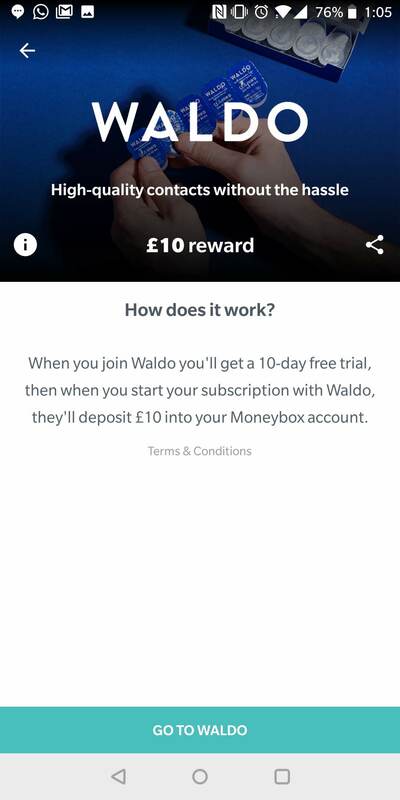 When you choose a product – let’s go with Waldo, a company that sells contact lens subscriptions – you’re taken to their website from the Moneybox app. 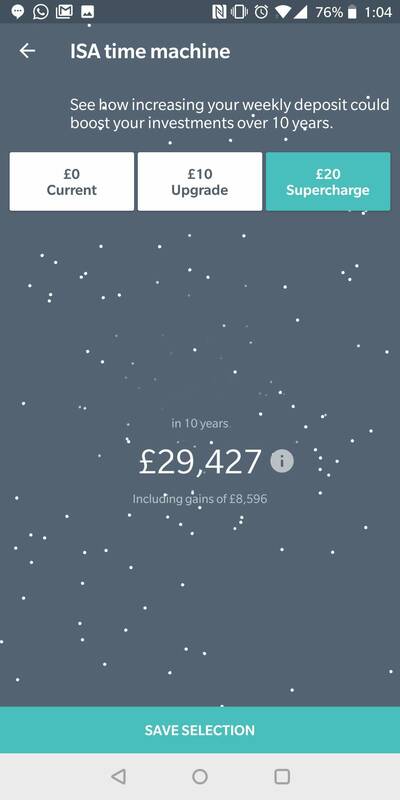 Moneybox takes a £1 monthly fee out of your investment, but it’s free for the first three months. On top of this, there’s a 0.45% platform fee, and fund fees of 0.22% - 0.24%. 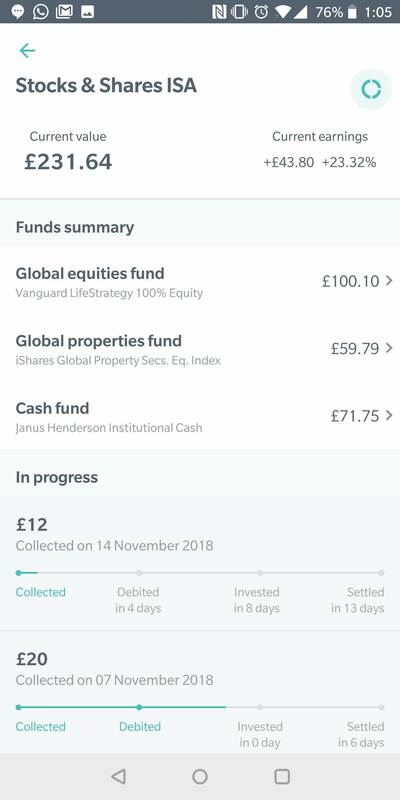 The £1 fee covers the overall investing costs, and Moneybox takes it by selling a little bit of your biggest shareholding. The platform fee is also taken at the end of the month, but it builds up every day. Like the £1 investing fee, it’s collected by selling your biggest shareholding. The fund fees are charged directly by the firms that provide the funds: Vanguard, Henderson and Blackrock. As well as the standard phone and email customer contact channels, Moneybox offers in-app messaging with their customer service team. Customer support is available between 9am and 5.30pm. The last few years has seen a boom in the number of investment apps, or “ robo-advisers”. Here's how Moneybox compares. Nutmeg is highly-rated by our community of reviewers, who have praised it for ease of use, flawless design and first-rate customer service. But Nutmeg is likely to appeal to a different audience than Moneybox, because it has a minimum initial investment of £500. And if you invest less than £5,000, you have to deposit a minimum of £100 per month. Nutmeg doesn’t charge any flat fees. It takes between 0.3% and 0.95% of your portfolio, depending on its size. So, although it’s beginner-friendly, Nutmeg is more suitable if you’ve got enough money to have a serious go at investing. Wealthify accounts can be opened with just £1, making them a good option if you don’t have loads of money to invest up-front. Wealthify offers a Stocks and Shares ISA, but you can also take out non-ISA investment plans. There’s also a specialised ethical plan, which invests your money in socially and environmentally positive enterprises. Wealthify’s fees are based on how much you invest, with higher charges for their ethical investment plans. The fee structure is clear and transparent: you can use a calculator on their website to find out exactly how much you’d pay each month, in pounds and pence rather than percentages. Chip algorithmically calculates how much you can afford to save by connecting to your bank account and analysing your purchases. It then deposits this amount into an instant access savings account hosted by Barclays. 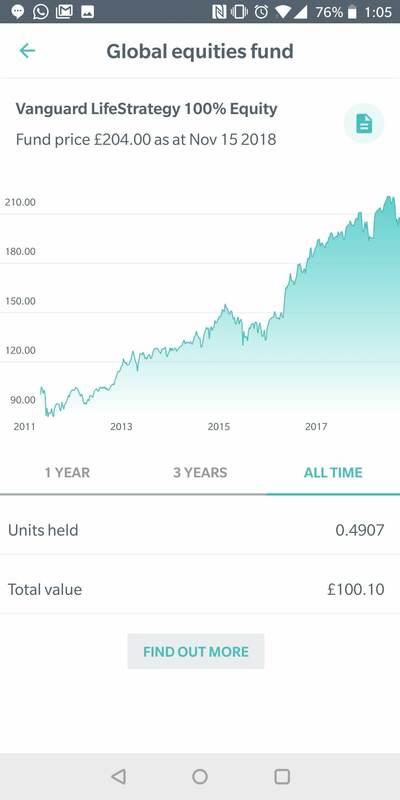 Chip is different to Moneybox in that the money isn’t invested, but it’s based on the same principle of tucking away small amounts of money that you won’t miss, which can make a big difference over months and years. One of Chip’s biggest drawbacks is that it only connects to a limited number of bank accounts. Challenger banks like Starling and Monzo can’t connect. 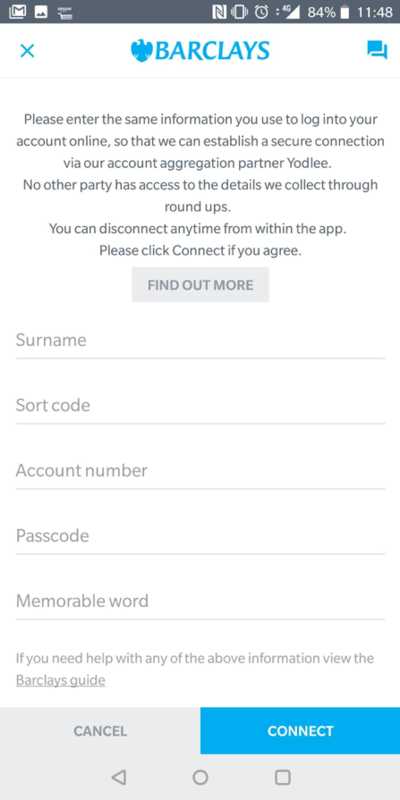 Although Monzo is a current account provider rather than an investment app, the Monzo team recently launched a new feature with similarities to Moneybox. Monzo’s “Pots” feature lets you move your money away from your main account to help you manage your spending. You can set a target, give the pot a description, and monitor how close you’re getting to your goal. Back in March, Monzo launched a special kind of pot, called a “Coin Jar”, which, like Moneybox, rounds up purchases and separates it from your main current account. You also have the option to turn an existing pot into a coin jar to boost those savings. It’s not exactly like Moneybox – your savings aren’t invested, just squirreled away – but it’s the same kind of saving: taking spare change and putting it to one side. But unlike with Moneybox, Monzo lets you access that money instantly. It will be interesting to see the take-up, and whether Monzo develops the idea any further. 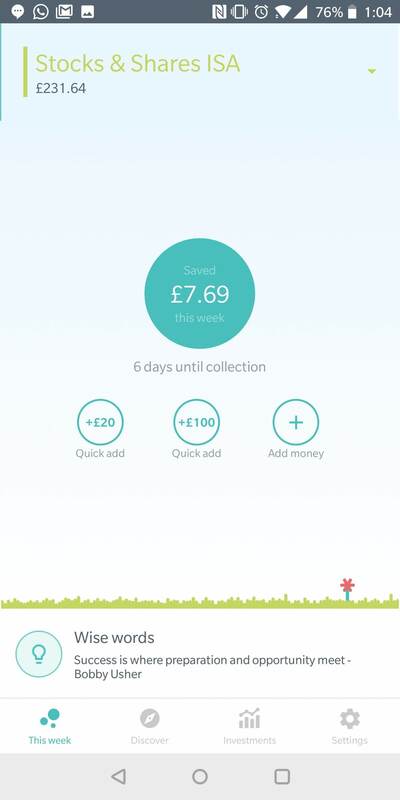 If you’ve used Moneybox – or any other investment apps – you can leave a review.